A story is told that one day a man saw his child walking along the beach and she was stooping over again and again to pick something up and throw it in the water. The man drew closer to the child to investigate, and realized that the beach was covered in starfish as far as the eye could see—brought in with the tide and now stranded. The little girl was picking them up one at a time and throwing them back into the ocean. The little girl picked up another starfish and stared down at for a minute. Then she held it up to show her father and said, “It matters to this one.” And she threw it in the water. The point of the story is simple and clear: even the small things we do matter. Whatever we can do to help makes a difference. The little girl understands this, but the father doesn’t. He’s overwhelmed by the magnitude of the problem and the fact that any impact he could make doesn’t seem worth the effort or cost. And so he does nothing. In our scripture passage for today, Elijah is a stranger far from home. There is a severe drought. He has no food and no resources. And so he asks a woman—a widow with a son—for help. When he asks for water, she obliges—it seems easy enough to do. But then he asks for food – A morsel of bread. The woman falters. Elijah is relying on her on the most basic level. The culture in that day said it was a person’s responsibility to show hospitality to the traveler. It was far different than our modern culture – there were no hotels or restaurants, no cars or highways, no grocery stores to buy food. When someone was traveling, they depended on the hospitality of others. But she feels incapable of meeting his needs. She doesn’t have enough. She tells Elijah that she has only enough meal for her and her son to eat and then they will die. She feels overwhelmed, like the man in the starfish story. What difference could she possible make in the face of such need? But Elijah encourages her and tells her to trust in God. And so the woman does what she can. She shares what little she has, and to her surprise the meal and oil do not run out such that the three of them are fed for many days. My life does not look like the life of the woman in this story. Though I may sometimes stress about my budget, I am not short on food. I do not struggle with hunger. But I do know what it feels like to be overwhelmed by the scope of someone else’s need—to feel like I don’t have enough to give, like I can’t do enough. Maybe you know this feeling too. When we read the news, we’re inundated with all the hard, terrible things happening in our world: Countries shredded by war; refugees, many of them children, fleeing the violence, hungry and homeless; hurricanes and floods, earthquakes (three in Mexico this past month). The need is tremendous. As Christians, we believe that we are called to be generous, but I think this question of “enough” often gets us stuck – In a world as broken as ours, where do we begin? And perhaps a more troubling question, where do we stop? For surely if we tried to solve every problem and meet every need we would lose everything; we fear what we can give isn’t enough for the ones that need it. Sometimes—I’ll admit—I try to think of something else. Always I feel that same overwhelming flood of helplessness. What can I do, really? What can my small gift accomplish? These are hard questions. There is some value in recognizing that there is a larger system of brokenness at work, that one simple act of generosity cannot fix. Another modern fable tells of a river with a village on its shores. One day a villager notices a baby floating down the river and jumps in to save it. Then more and more babies come down the river and the villager gets a bunch of other people to help her save them all before they drown. Eventually, one woman leaves the group and starts to head upstream along the shore. Someone asks her, “Are you giving up?” And she says, “No, I’m going to find out how to stop these babies from ending up in the river to begin with.” We need both the generous love shown to individuals, as well as the deeper work to dismantle systems of injustice. Both are crucial. I don’t believe there is a clear answer to how much we should give, or even where to give. But we are told where to begin – Anywhere. 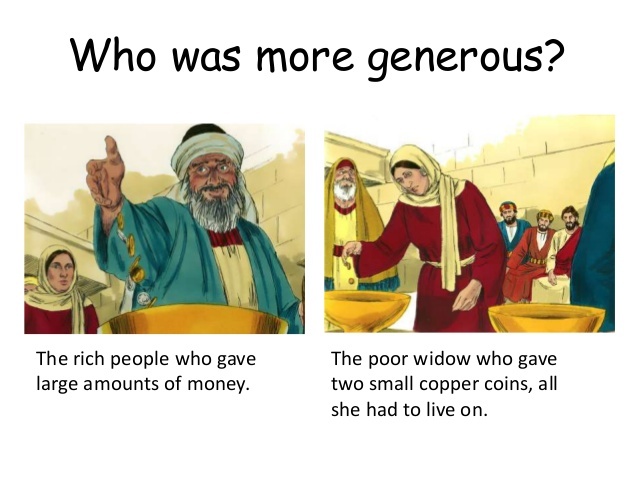 In our Bible readings, we hear of one widow sharing what little food she has, and another widow giving what little she has to the temple treasury. Both of them aware of the extent of the brokenness and need in the world, but trusting God, that what they have is enough. We are called to do something, to give something. We are called to trust that we are part of the larger work of God. I hear God speaking to us in these Bible readings. I hear God calling us to the same kind of love and care. The uncomfortable twist in our gut as we hear of someone struggling or as we witness the injustices of this world, or even as we see the need to minister to souls in our own community, is the Spirit reminding us that we are all one; that we are made family by the God who loves us all. When we act in love—whatever we do—we are reminded that we belong to each other; that our struggle is one struggle; that our story is one story. And that our hope is one hope. The little girl in the starfish story doesn’t ask whether she has can do enough to matter. She just knows that it matters enough for the starfish that she encounters—and they matter enough to her—to try and keep trying. Our faith will compel us to keep wrestling with the questions: How much is enough? But our faith also tells us that God offers us love and grace—and that love and grace help us to see each other, and empower us to love and serve one another in ways beyond what we imagine possible.